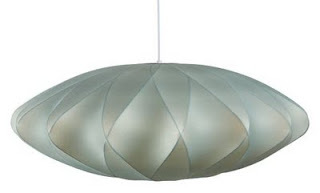 This colored version of the classic George Nelson Bubble lamp from Room and Board. I love the seafoam color, the mid-century modern design, the huge scale -36" diameter. Everything about it screams buy me... except we don't have a pendant fitting in the bedroom. While we are on the subject of lighting, and still shopping the George Nelson lighting section at Room and Board, I'd pick up a couple of these Cigar Sconces - one for each side of the bed. I'm planning to flip the room round again, well the bed at least. If I'm going for a new look I want to upgrade to a king-size so I'll need more wall space. It actually makes sense to do this so I can look at the newly cleared and planted side lawn. And we'll have the headboard on an interior wall and that's got to be warmer, right? 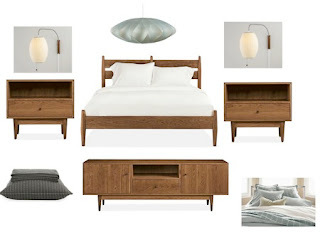 The bed was narrowed down a few months ago to one of these walnut beauties. The question is still which one... maybe Grove, again from Room and Board. 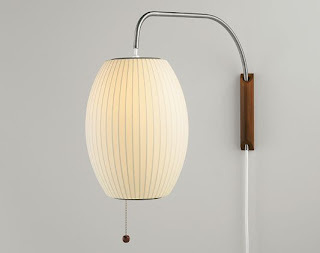 I confess I have an odd relationship with my George Nelson Bubble Lamp-- Kind of like Woody Allen's orb in Sleeper. I say go for it! That bubble lamp is amazing! I love everything about it. The bubble lamp is fabulous. And I know nothing about nothing but I *do* know that adding a ceiling fixture isn't that bad. Really! So if you're in love with it you can definitely make the magic happen.